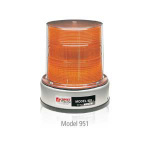 The Model 901, low-profile and Model 951, high-profile strobe beacons combine a high-performance power supply, durable aluminim base, and impact-resistant polycarbonate domes to provide superior warning that withstands the harshest environments. Both models are available in Single (115 VAC), Double and Quad flash versions. An optically superior, Fresnel dome maximizes light output. For additional durability, the Model 901 and Model 951 are protected by an impact resisitant dust cover.